Our expert team works closely with other St Christopher’s staff in order to co-ordinate support and care in a safe and effective way. Referrals come from a number of sources, including GPs, hospitals, members of the hospice multi-professional team and in some cases from patients themselves. 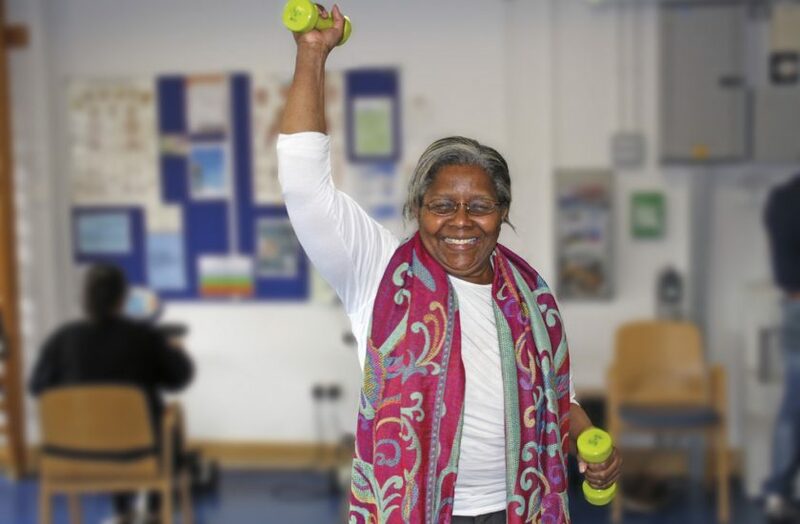 Outpatients will usually be offered a supervised and personalised 6-9 week program at one of our well-equipped rehabilitation gyms at the Sydenham or Orpington site, during which goals and progress will be reviewed and exercises adapted to build confidence and activity. Patients may be given a personalised exercise program to do at home at the same time. Inpatients at the Sydenham site will have access to the gym, and this will usually involve a personalised exercise program supervised by a physiotherapist or assistant. If you would like to exercise at home we have created a series of videos showing you some exercises that you can do lying down, sitting and standing up. View our video on The Gym at St Christopher’s below, which may be useful for patients and families/carers to watch. We have also developed a set of videos designed to give people advice and information about managing breathlessness. For Inpatients – Occupational Therapists can advise and assist with rearranging or adapting the home environment so that it’s more suitable for a patient’s needs. They can also offer practice runs to trial an activity or a particular piece of equipment before going home. At St Christopher’s we appreciate that living with a chronic, long term or terminal illness can be difficult. 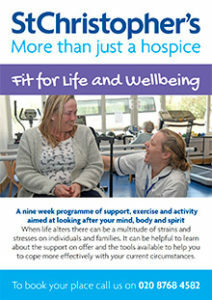 Fit for Life & Wellbeing is a free interactive course for anyone living in St Christopher’s catchment area who is suffering from a life limiting, long term, or chronic illness. It combines a weekly exercise session in the rehabilitation gym at Sydenham, with an education program of helpful sessions designed to help you cope and live better with your condition. You do not have to be a patient under St Christopher’s already but will come under our service specifically for this input, for the duration of the course. It takes place on Wednesdays 3-5pm at St Christopher’s, Sydenham. Please note this course is not available at the Bromley site. To refer yourself into this course, please call the Single Point of Contact on 020 8768 4582. Input from a Dietitian and a Speech and Language therapist at St Christopher’s is also available for patients on the Inpatient Unit or by appointment in Outpatients. Specialist advice and intervention can be provided for people where appropriate. Referrals are made via a member of the multi-professional team at St Christopher’s.